As the U.S. enters the midterm elections, we face an unpredictable, dangerous, and highly politicized situation. Millions are agonizing over what’s taking place – from the Trump/Pence regime’s fascist offensive to the intensification of this system’s horrors, and more – even as they are largely looking for answers in the wrong place. At such a moment, let’s be bringing people what is most desperately missing: an understanding of WHY all this is happening… why are thousands of immigrants—men, women, and children—fleeing their homelands at risk of their lives to come to the U.S.? Why are the Democrats silent in the face of this and have no answer that does not accommodate with the fascists? What does the unleashing and emboldening of white supremacists, Nazi anti-Semites, and aggrieved misogynists unleashed by the Trump/Pence regime have to do with the history of this country and the regime’s strategic game plan for this society and the world? And most importantly: What is the problem, and why the deeper underlying causes of all these horrors—the oppression of Black people, of women, of immigrants, the wars, and the environmental threat to the planet—reside in the system of capitalism-imperialism, which has now given rise to a fascist regime imperiling all humanity—and what is the solution, the way out of the madness, horrors, and existential crises threatening humanity and the planet, and what we need to do now! This SYSTEM CANNOT BE REFORMED… it MUST BE OVERTHROWN! 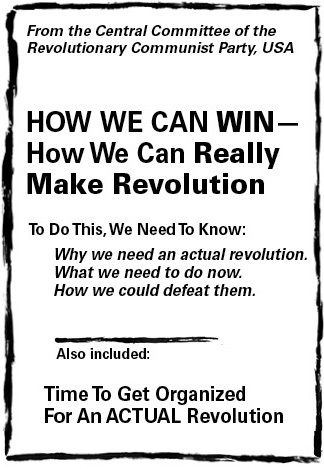 There is a strategy for making revolution, for winning, now elaborated in the speech by Bob Avakian (BA) in two parts: Why We Need An Actual Revolution And How We Can Really Make Revolution. This week, we are also featuring three clips from the Q&A following the speeches, which provide crucial orientation. 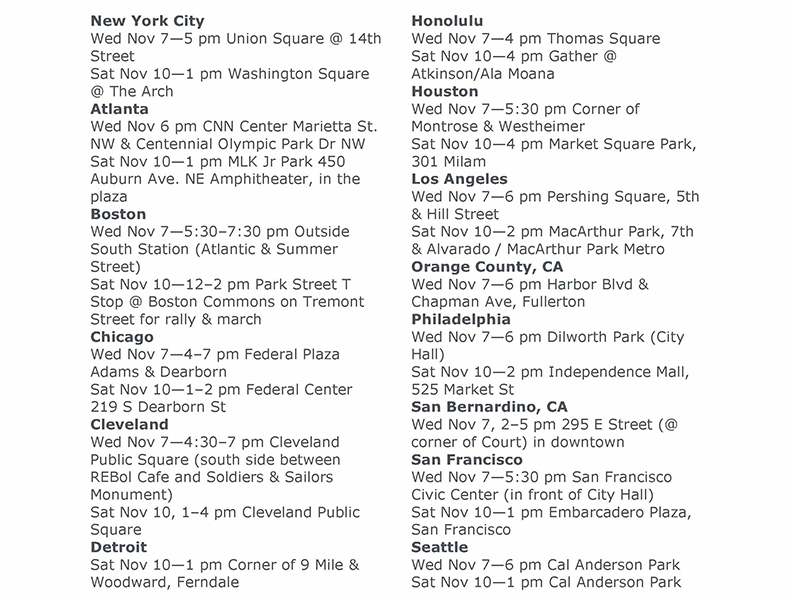 WE SHOULD BE EVERYWHERE… spreading the speeches Why We Need An Actual Revolution And How We Can Really Make Revolution and THE TRUMP/PENCE REGIME MUST GO! 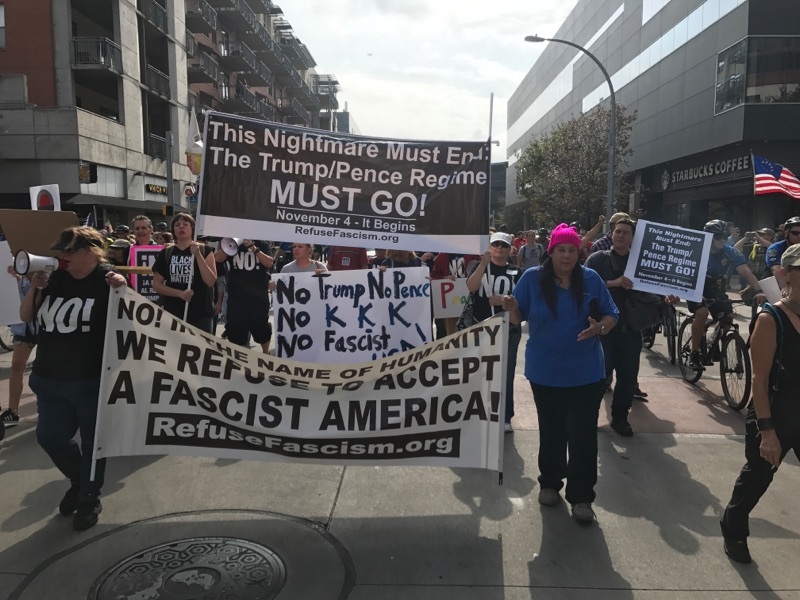 In The Name of Humanity, We REFUSE To Accept a Fascist America. 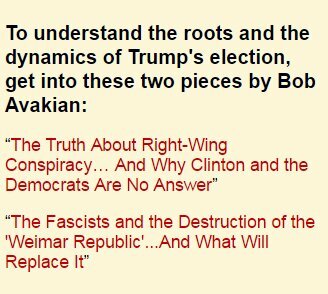 A Better World IS Possible, and these three clips—bringing the leadership we have in Bob Avakian to people and building the movement for an actual revolution. Spreading these films is spreading revolution—and this coming week, let’s dramatically ramp up screening these films—organized and impromptu with imagination, everywhere people are gathering, everywhere there are people discussing and arguing about what should be done. Show the film on walls and in the streets, in bars or cafes, in neighborhoods and around college campuses, in classrooms, living rooms, barber shops, nail salons, and car washes. On Election Day, ride the trains and play clips. Go to bars and campus cafes where people are watching returns and play the clips. 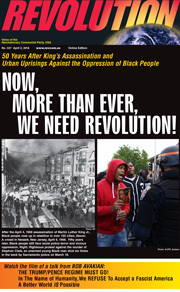 Be out among the people with these materials… enlisting them in spreading—and organizing people into—the revolution. After every showing ask people to pull out their phones and help spread the trailer and the clips on social media. 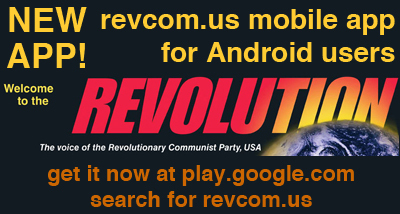 Write us at revolution.reports@yahoo.com and share your experiences on social media—where ever you are—big city, small town, prison cell, or with Americans and others overseas. If you are an artist, if you are active in the immigrants’ rights movement, a member of a student group, a member of church, mosque, or synagogue, active with the ACLU, progressive Democrat groups. If you work in a company or in a NGO, if you know youth groups and people trying to serve the community. If you are active in the environmental or animal rights movements or on an athletic team, if you are part of any kind of family, or if you are just one person with an outrage and a conscience: YOU can post the clips featured here on Facebook pages, Twitter, and Instagram accounts, to blogs and various lists. If you are someone with a large following on social media you can make an impact by saying that this—this whole question of reform and revolution—needs to be engaged by everyone, not foreclosed because it pushes people beyond comfort zones. This is a time when the courage of people to open up the most fundamental questions and solutions will be part of how history will judge all those who do, or could have, known better. Revolution Clubs and those relating to the movement for an actual revolution: Put before people what we are trying to do, in spreading this revolution and the problems we are trying to solve, getting their ideas to contribute to a national movement while at the same time unleashing them to take various initiatives themselves. 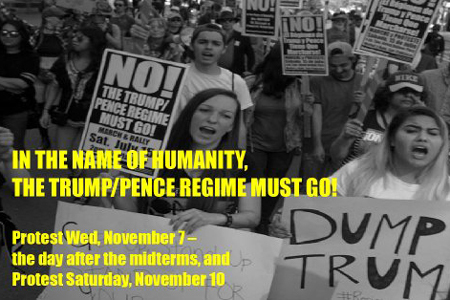 IN THE NAME OF HUMANITY, THE TRUMP/PENCE REGIME MUST GO! All this raises people sights to the possibility of a radically different world, the need to fight for that world, and involves them in this process. 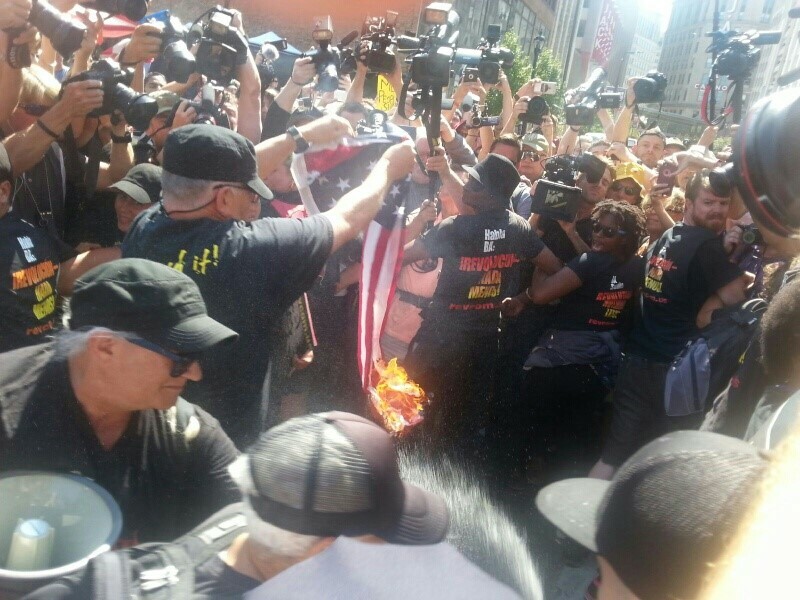 How to spread the fighting spirit confronting fascists despite what Dems say? 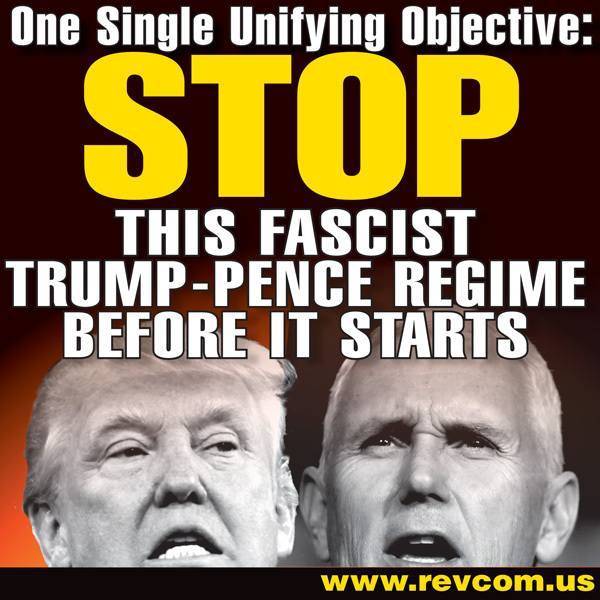 What would be the next step if the Trump/Pence regime consolidates power?